Straight from the official announcement from the NAVUG Summit at Tampa yesterday. The only Dynamics products that will retain it’s name are the NAV, GP, and SL lines. 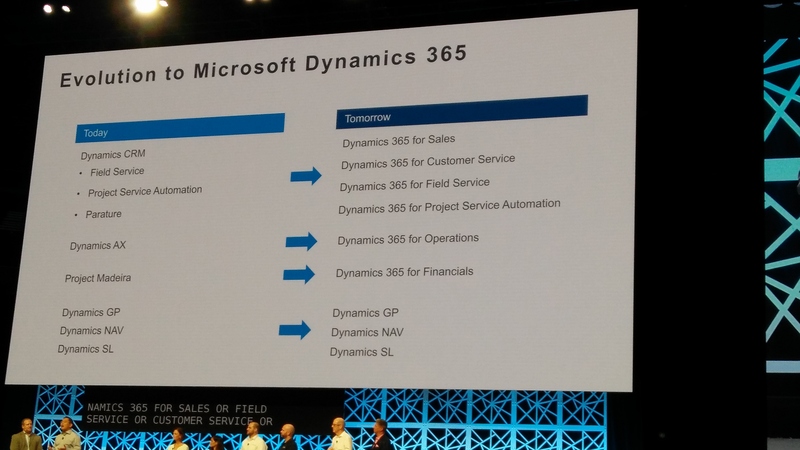 So basically, you will be able to buy individual business functions with Dynamics 365. The best part about all this is that all the products has a Common Data Model. This means that all of the business functions you buy from Dynamics 365 will automatically be synced together. This is too cool. The official release date announced for Dynamics 365 is on November 1st, 2016. At the keynote session, Paul White officially announced that Dynamics NAV 2013 R2 is officially released. The main theme of this year’s Directions is the tight integration between Office 365, Windows Azure, and deploying Dynamics NAV2013 R2 in the cloud. What Does “tight” Integration Mean? You know the story. With every release of Dynamics NAV, Microsoft has been touting the release enables Dynamics NAV to be tightly integrated with Office. For years, I never understood what that meant. Office is office, Navision is Navision. To make these 2 talk to each other, you had to cut off an arm and a leg and do a rain dance to start the first steps of integration between the 2 products. So when I first heard say that Navision is now tightly integration with Office 365, in my mind, I thought “here we go again”. To my surprise, the integration now a lot more seamless. Now to be honest, I was not impressed. The reason is because when I first heard about integrating Office and Navision, my impression of it is what they showed us as of right now. Having said that, there are still a lot of improvements to be had but during this session, I actually felt comfortable and (more importantly) worthwhile rolling this out internally within my organization and recommending it to our clients. Obviously, words cannot clearly articulate what this “tight integration means. So we will need to wait until Microsoft release more “How Do I” videos on MSDN or Youtube. Dynamics NAV now has 98,000 customer installs worldwide! This number just bellows me away. Wasn’t it just 2 years ago that Microsoft reported that the installation was around 80k? – Dynamics NAV 2013 and future releases of Navision can now just do technical upgrades (not full upgrades) Once you’re on Dynamics NAV2013, future upgrades will be easier because you can now upgrade databases using Shell commands. – The food this year was faboulous. It was a tremendous improvement over last year. – Claus Lundstrom has issued a public challenge to me stating that he can create/modify a RDLC report faster than I can do so in the classic client. Look for this in my next blog post. It’s nice to see some fellow Microsoft MVPs in this event. I had to hunt down Matt Traxinger because he refused to introduce himself at all during the event. I only met him by accident as I happen to walk past him getting a beer. The person missing here is Rashed Amini. I couldn’t find him even though he’s the tallest amongst all of us. First, I’d like to apologize to the readers of this blog for not updating with new and useful content about Dynamics NAV. I know the last update on this blog was back in January and it just seemed like I’ve disappeared. It’s a book that teaches new users, whether end user or beginner, on how to create an application in Dynamics NAV 2013 based off of a real project that I’ve done in the past. I hope you will enjoy the book as much as I did writing it. If you enjoyed my style of writing, which is probably one or two of you, now you can extend the joy in a full book version. I tried to bring my unique sense of dry humor so you won’t get too tired going through the whole book. A big special thanks to Daniel Rimmelzwaan for his extra efforts on being the content editor of this book. Companies that bought Dynamics NAV and make continuous improvements in the system are less likely to go out of business or sold off. Have any of your customers, who is active before the recession, during the recession, and now, gone out of business or have been sold? When we partners say customers are “active”, we mean customers that frequently calls us to request new functions, ask our opinion when there is a new business problem, automating and sometimes obliterating their process to become more efficient. Not active meaning they only call you for bugs and error messages they can’t resolve on their own. “Active” customers also means that they’re using Dynamics NAV as their primary ERP system. This means they’re not running parallel with some other accounting or ERP software. The answer I got back from the partners was a resounding no. Meaning that companies that make continuous improvements to their Dynamics NAV system before and during the recession until now have survive and thrived. Of course, this is only based on the partners I speak with at Directions and does not qualify for actual formal research. I’d like to hear from you from your experiences. Has any of your Dynamics NAV customers that were “active” before the recession, during the recession, and now ever gone out of business or being sold? 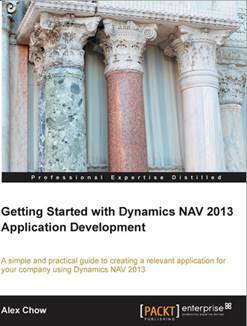 The theme for this year’s Directions is Dynamics NAV 2013 is here! This is release is what 2009 should’ve been. Microsoft reiterated that with Dynamics NAV 2013, it’s ready and you will not need to wait for a service pack. From what I’ve seen on the early release of Dynamics NAV 2013, I have to agree with them. It’s runs a lot faster with a lot of usability features. Microsoft has done an INCREDIBLE job of documenting the features and creating step by step instructions on how to do this on our own. Well done Microsoft, well done! The Paul White from Microsoft, has reiterarted the focused target market Dynamics NAV is between 5 to 250 concurrent users. That’s not to say NAV cannot support 1000+ user implementations, but Microsoft marketing is geared towards the small and the mid-market. The continual message from Microsoft this year is, of course, go vertical and go cloud. Both of these 2 strategies benefits Microsoft, but I’m not sure it benefits the partners. Why? Because some of the largest solution center in the US are not vertical and are not a lot of cloud. Anyway, same message, go vertical go cloud or die!!! One important detail which I notice was missing from this year and the prior year was microphones for the audience to challenge what the keynote speaker was presenting. This was my favorite part of the “old” Directions because it allowed the partners to express publically their concerns and we can hold the Microsoft executives and managers accountable based on their responses. Now, I learned that in order to talk to these Microsoft executives, you had to schedule a private meeting with them, which is a real shame and I think it does take away from the feedback process. 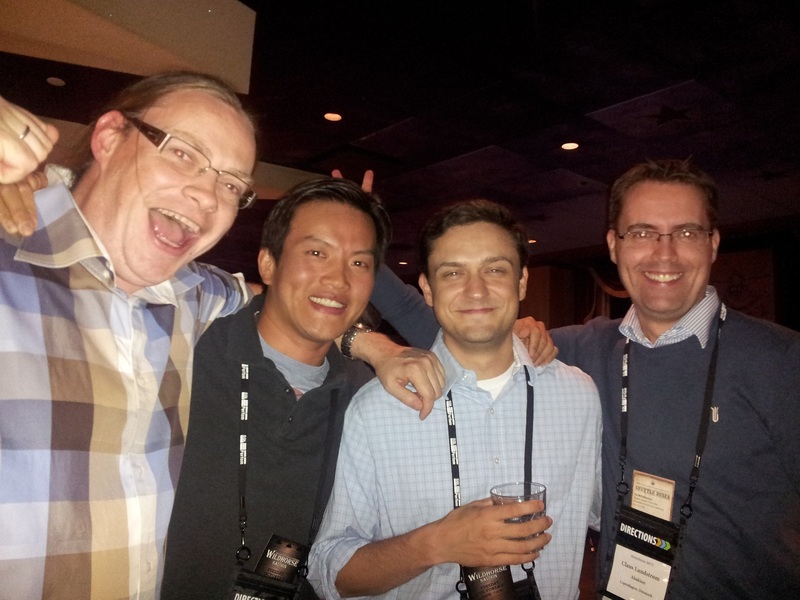 There were a ton of technical sessions on Dynamics NAV 2013. The folks at Microsoft Directions were gracious enough to share their information on here. No, I didn’t make a mistake on the link. Most of the sessions I attended were the executive and sales sessions because I think the information given on these sessions cannot be transferred properly from the internet. It looks like business has also picked up in our industry. A lot of the attentees that were missing last year have returned. I’ve also noticed a few more new ones that showed up to these events. This tells me that the Dynamcis NAV business is doing good. Very good. One other thing I noticed is that there were a lot of woman in this Directions than the previous ones. Not those eye candy ones, but the ones that are project managers, developers, implementors, support, etc. These woman are truly passionate, incredibly smart, and driven working with Dynamics NAV. That blew my mind a little. By the way, the first boss I had was a female whom I have tremendous respect for, so this comment is not meant to be sexist at all. It wasn’t from any of the sessions. A couple of us solution centers got together on a small table and had an open talk about our business. About employees, what our revenues were, and what we took home as owners. We dived in detail about our fears and problems that comes with being a leader of an organization. It’s truly refreshing to speak with people that are in the same boat as you are, sharing your concerns and worries. I hope our little group can get together again next year and talk again next year. Mobile NAV. Yes there are a ton of mobile NAV add-ons out there. This one caught my eye because their mobile app is actually pleasing to use. When you’re mobile, usability has to be king. I think these guys comes pretty close. Of course, ease of use is in the eye of the beholder, so you would probably need to try it out on your own. Easy Security from Merge Tool from Per Mogensen. No more adding 50 tables to control security! Yeh!! This product is fully CfmD Certified and works with pages and forms. A very well done add-on to any client site that needs a better way to control who can edit and see what on which field. Fun Fact about Per: He is the only guy that has an authentic smile on his face when he talks about coding architure and coding itself. He really takes pleasure in this stuff. Don’t believe me? Next time when you’re at a conference with him and he gets into coding questions, just observe him. Terrible. No variety, even the food for the Partner Celebration day was bland. I was full, but I was not satisfied. It was a good event, but this one is a Microsoft event, not a partner event. The only true partner to partner connection I had was in our private session that I described earlier. Personally, I wouldn’t mind having it at a crappy hotel instead of a vacation resort. And I wouldn’t mind paying more for registration for it to be a true partner event instead of a Microsoft event. The food defintely needs to get better because I’m one of those people that like to get 2nds. Microsoft is a technology organization. It’s their job to develope new technologies that business and individuals can use to improve upon their lives. Having said that, there are A LOT of products that Microsoft releases and as an end user, it’s really hard to keep up with everything going on. Being in an IT professional, it’s even hard for me to keep up. There are many times where the customers will go out and see a demo of something that can drastically improve their business. Being a Microsoft partner, they would come back and ask us to give them feedback on what our thoughts on it and how to implement it. The problem arises when we see the value of it for our customer as well. Why? Being a Dynamics NAV partner, our sole focus is on NAV. The pros of doing this is that we really know what we’re doing and we’re really good at it. The bad is that we are not as diversified in the “Microsoft Stack”. Companies prefer to do business with partners they trust, since we worked hard to earn that trust, they want us to replicate that same kind of proficiency in other Microsoft products as well. This question used to haunt me and I cringe everytime a client ask me this question. Before, I always refer them to local IT businesses that I met at trade shows. But the problem is that I do not know how they work or if they hold themselves to a high quality of standard that I owe to our customer. Referring them to a bad company is like me doing bad work for them. It damages the trust that we built with our client. It occured to me that I belong to this program called the Microsoft MVP program. For those of you who don’t know, it’s a program that Microsoft awards to individuals that demonstrates their proficiency in a particular product through contributions in the community. In another words, they know their stuff. In the world of public community and forums, if you don’t know your stuff, you’re caught and hung right away. For some reason, this program is not very well known. It’s almost as if people are trying to keep it a secret. I find this to be invaluable directory to the most qualified professional in their respective products. After referring a couple of fellow MVPs in different product lines, I’ve gotten pretty good feedbacks from our clients. They obvious care about their product line so they know the ins and outs of the product and the pitfalls during implementation. I’m a happy camper also because the customer can continue to come to me to get reliable advice on anything. I’m also assuming your time is valuable and you do not want to spend more time than necessary to complete certain tasks. Most of the MVPs will command a high rate. So why is it cost effective? Consider the alternative. You can outsource to India or China where they’ll charge you $18.00 an hour (I may have gotten offers for lower), the headaches, overtime, downtime, frustration, missed deliveries, communication faiulres, plus everything else that executives won’t see in an IT quote will be a lot more expensive (both money and human resource) than if you hired a MVP to do it right the first time. Of course, due dilligence has to be paid. Just because someone is MVP does not make them qualified nor does it make them “fit” for your company and your needs. Anyways, here’s the link to the MVP Program.